JOHN SWAN, Class leader at Donaldson’s Lodge, in the Lowick Circuit, follows in the footsteps of his late father, who was a devoted Primitive Methodist worker. In this Circuit the old-fashioned kind of Class meeting is not observed but Mr. Swan often renders effective service as a leader in the Christian Endeavour Class. He is in some respects a model Class leader: in his exemplary life, his most regular attendance at the House of God, his brief and appropriate exercises in the prayer meeting and in services for testimony, and in his great attention to the finances of the chapel and of the Circuit. He assiduously distributes the Class Tickets and collects the quarterages and seat rents, copied in this by his son. Mr. Swan is also the Sunday school superintendent, the leader of the choir and the-Book Steward, taking a deep interest in the circulation of the Magazines. It is only fair to add that his wife, Mary Swan, is a tower of spiritual strength to him, helps him in his good work in every way, and provides cheerful hospitality for the preachers who visit Donaldson’s Lodge. When any of the members are ill or in trouble he will gently inform the minister, and thus those in sorrow get ministerial comfort and help. Should any of his people say that he is visiting in search of finances for the church and that he is begging, he will say “Oh, I am not begging, I am gathering in your just dues to your church.” Mr. John Swan is not merely a Class leader ; he is also Society steward, he is a Church leader and a leader of the Circuit, a leader in Israel and of course he is a contributor to the Centenary Fund, and to all the funds of our Church. 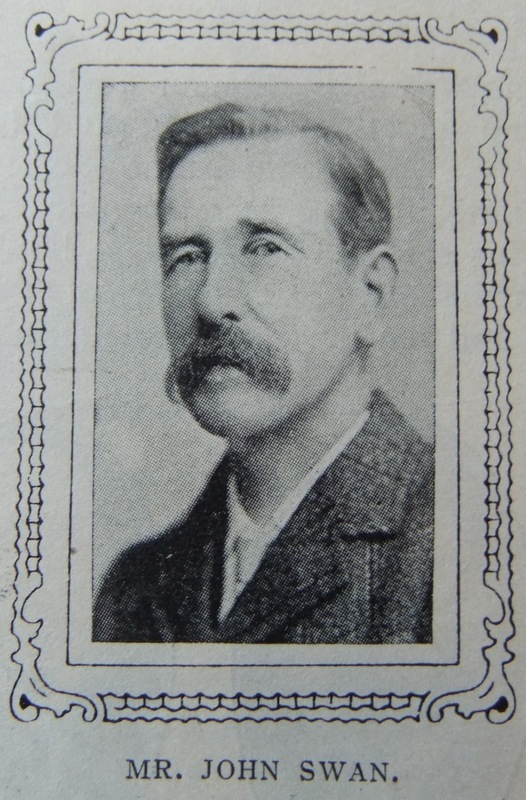 John was born in 1858 at Cornhill, Northumberland, to parents John, and Mary. John, senior, was a salmon fisherman on the River Tweed, a profession that John also followed. John married Margaret Fulton (1857-1945) in 1883. Census returns identify four of five children. John died on 8 October 1942 at Donaldson’s Lodge, Northumberland. Note: The sketch gives an incorrect name for John’s wife.